The Lenovo ThinkServer TS150 is the perfect first tower server for small and medium businesses, remote or branch offices, and retail environments. It features the latest Intel Xeon processor E3-1200 v5 product family with four cores and support for up to 64 GB of 2133 MHz DDR4 UDIMM memory. Up to 24 TB of internal enterprise-class storage supports storage-intensive workloads, such as office applications, web, e-mail and file and print serving, and provides growth capacity. This product guide provides essential presales information to understand the ThinkServer TS150 offering, its key features and specifications, components and options, and configuration guidelines. This guide is intended for technical specialists, sales specialists, sales engineers, IT architects, and other IT professionals who want to learn more about the TS150 and consider its use in IT solutions. 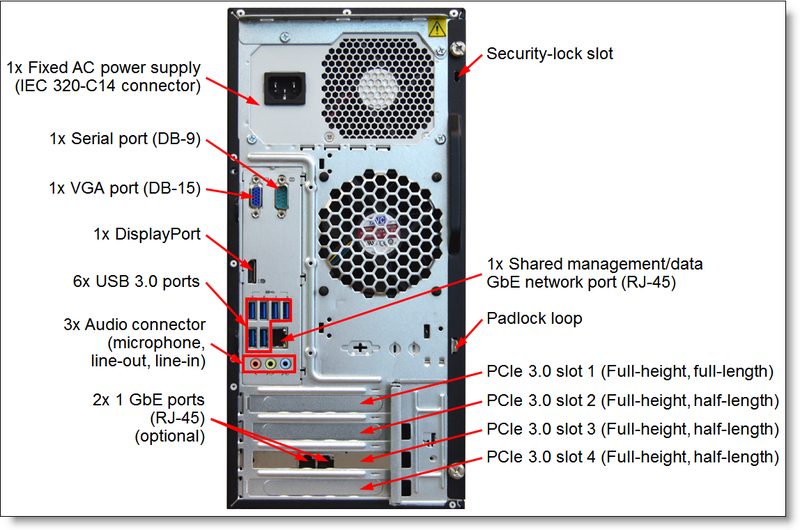 This Product Guide describes models of the Lenovo ThinkServer TS150 with the Intel Xeon E3-1200 v5, Core i3 6100/6300, Pentium G6100/6300, and Celeron G3900 Series processors. For models of the Lenovo ThinkServer TS150 with the Intel Xeon E3-1200 v5/v6, Core i3 6100/6300/7100/7300, Pentium G6100/6300/7100/7300, and Celeron G3900 Series processors, see the following Product Guide: Lenovo ThinkServer TS150 (Intel Xeon E3-1200 v5/v6, Core i3, Pentium/Celeron G Series Processors). The Lenovo ThinkServer TS150 is the perfect first tower server for small and medium businesses, remote or branch offices, and retail environments. It features the latest Intel Xeon processor E3-1200 v5 product family with four cores and support for up to 64 GB of 2133 MHz DDR4 UDIMM memory. Also, it offers an integrated NIC and additional PCIe expansion slots for advanced RAID protection and network scalability. Up to 24 TB of internal enterprise-class storage supports storage-intensive workloads, such as office applications, web, e-mail and file and print serving, and provides growth capacity. 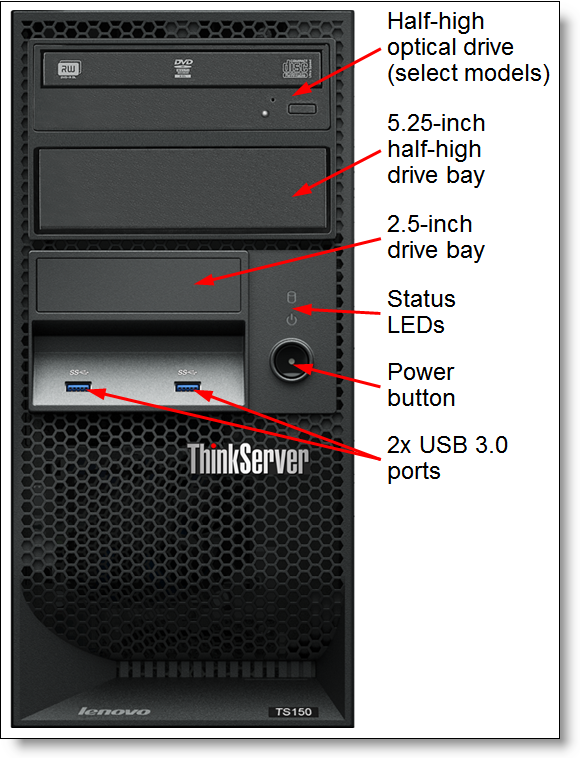 The following figure shows the Lenovo ThinkServer TS150. The TS150 offers enterprise-class reliability features such as error correcting code (ECC), the onboard RAID controller, and enterprise-class hard drives and network adapters at an affordable price. Intel Active Management Technology (AMT) built into the TS150 offers easy-to-use, industry-standard management tools for remote monitoring, updates, and repairs. The TS150 runs a wide range of server operating systems, and it also supports client OS capability. The TS150 is among the quietest tower servers in the industry that fits under or beside an office desk. 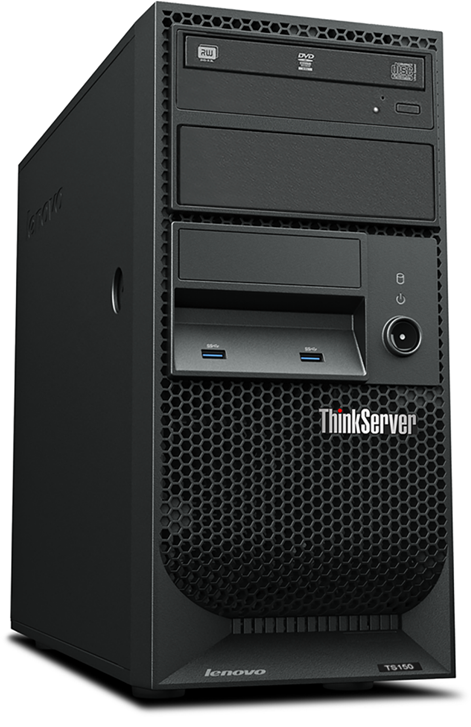 The ThinkServer TS150 server is an office-friendly tower server that has been optimized to provide enterprise-class features to small-to-medium-sized businesses, retail stores, and distributed enterprises. The Intel Xeon processor E3-1200 v5 improves productivity by offering affordable single-socket system performance with 4-core processors with up to 3.7 GHz core speeds and up to 8 MB cache. Up to four 2133 MHz DDR4 ECC or non-ECC UDIMMs provide speed and capacity of up to 64 GB. The server offers PCI Express 3.0 I/O expansion capabilities that increase the theoretical maximum bandwidth by almost 100% (8 GTps per link using 128b/130b encoding) compared to the PCI Express 2.0 (5 GTps per link using 8b/10b encoding). Up to five non-hot-swap (NHS) drive bays provide flexible internal storage capacity. The use of solid-state drives (SSDs) instead of, or along with, traditional spinning drives (hard disk drives or HDDs) can significantly improve I/O performance. The TS150 supports UDIMM memory with ECC protection which provides error correction not available in PC-class "servers" that use parity memory. Avoiding system crashes (and data loss) due to soft memory errors means greater system uptime. Tool-less cover removal provides easy access to upgrades and serviceable parts, such as memory and adapter cards. A choice of affordable onboard SATA RAID or advanced hardware RAID redundancy offers data protection and greater system uptime. Built-in Active Management Technology continuously monitors system parameters, sends alerts, and enables administrators to perform remote recovery actions to minimize downtime. The ThinkServer EasyUpdate firmware update tool enables you to keep your server firmware up-to-date and helps you avoid unnecessary server outages. The ThinkServer Diagnostics software speeds up troubleshooting tasks to reduce service time. One-year or three-year customer-replaceable unit (CRU) and onsite limited warranty with next business day response. Optional service upgrades are available. Active Management Technology monitors server availability and enables administrators to perform remote management. The ThinkServer EasyStartup tool simplifies the process of configuring RAID and installing supported Microsoft Windows and Linux operating systems, VMware hypervisors, and device drivers on a ThinkServer system. Optional Trusted Cryptographic Module (TCM) (available only in China) enables advanced cryptographic functionality, such as digital signatures and remote attestation. Administrator's and power-on passwords help protect from unauthorized access to the server. Optional server locks such as a padlock or cable lock help prevent unauthorized access to the internal components of the server, and the intrusion switch (select models) informs about the removed or improperly installed server cover. 80 PLUS Platinum-certified power supply (select models) enables greater energy savings while providing flexibility to meet your business needs. Intelligent Cooling Engine (ICE) actively monitors component temperatures in real-time and optimally adjusts the speeds of the fans to keep the system cooler and quieter. The ThinkServer Power Planner tool provides information about the power consumption and electric current calculation for the different configurations of servers and other devices, which helps plan deployment of servers and devices in an efficient way. The following figure shows the front of the TS150. The following figure shows the rear of the TS150. 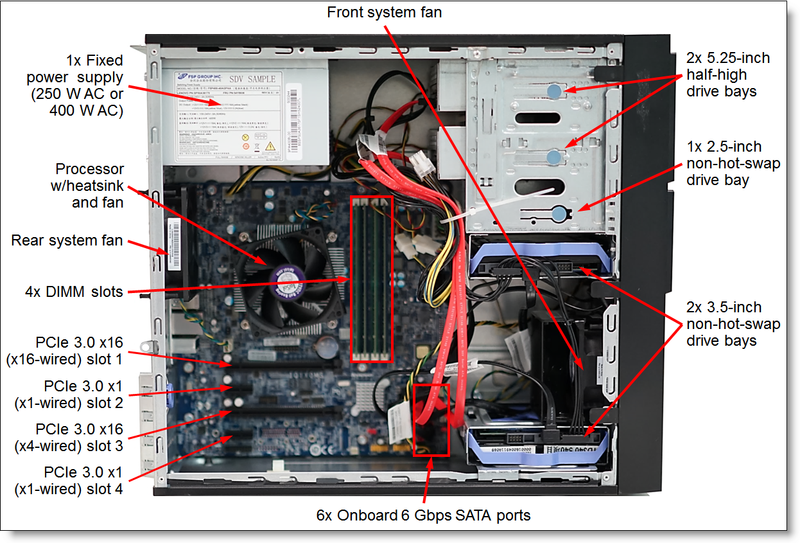 The following figure shows the internal components of the TS150. Intel Celeron Processor G3900 product family with two cores up to 2.9 GHz, 2 MB cache, and up to 1866 MHz memory speed. Memory Four DIMM sockets. Support for ECC and non-ECC UDIMMs. DIMM speeds up to 2133 MHz. Memory types (ECC and non-ECC) cannot be mixed. Memory maximum Up to 64 GB with 4x 16 GB UDIMMs. Memory protection Error-correcting code (ECC) memory (with ECC DIMMs). Drive bays 4x 3.5-inch + 1x 2.5-inch non-hot-swap SATA drive bays. Optional 2x SD card slots. SD cards up to 8 GB. Intermix of SATA HDDs and SSDs is supported within a system, but not within a RAID array. Non-RAID with the integrated SATA controller. RAID 0, 1, 10, and 5 with ThinkServer RAID 121i. RAID 0, 1, 10 with ThinkServer RAID 520i. Optional RAID 5, 50 upgrade. Optical drive bays Two without a backup drive or one with a backup drive. Support for DVD-ROM or DVD-RW. Backup drive bays One. Support for the optional RDX backup drive. Network interfaces One integrated Gigabit Ethernet (10/100/1000 Mbps) RJ-45 port (Intel I219LM): A shared port for management and data. Front: 2x USB 3.0 ports. Rear: 6x USB 3.0 ports, 1x DisplayPort port, 1x DB-15 VGA port, 1x DB-9 serial port, 3x audio connectors (line-in, line-out, microphone). Internal: 1x USB 2.0 port for the RDX backup drive. Cooling Three fixed system fans with Intelligent Cooling Engine (ICE). Power supply One fixed 250 W AC (100 - 240 V) power supply (80 PLUS Bronze) or one fixed 400 W AC (100 - 240 V) power supply (80 PLUS Platinum). Systems management UEFI, system LEDs, ThinkServer EasyStartup, ThinkServer EasyUpdate, ThinkServer Power Planner, and ThinkServer Diagnostics, Intel Active Management Technology (AMT) 11. Security features Power-on password, administrator's password, Intrusion switch (select models), Trusted Cryptographic Module (TCM) (optional), security lock slot, and padlock loop. Intel HD Graphics integrated into a processor (select models). NVS 315 Graphic Adapter by NVIDIA (select models). Maximum resolution is 1920x1200 at 60 Hz with 32 bits per pixel (16M colors). Operating systems Microsoft Windows 10; Microsoft Windows Server 2012, 2012 R2, and 2016; Red Hat Enterprise Linux (RHEL) Server 6 and 7; SUSE Linux Enterprise Server (SLES) 11 and 12; VMware vSphere (ESXi) 5.5, 6.0, and 6.5. Warranty One-year or three-year (model dependent) customer-replaceable unit (CRU) and on-site limited warranty with 9x5 next business day (NBD). Service and support Optional service upgrades (country-specific) are available through Lenovo Services offerings: 8-hour or 4-hour response time, warranty extension up to 5 years, Priority Technical Support, and Keep Your Drive Multi-Drive. TS150 relationship models are country-specific; that is, each country may define their own server models, and not all server models are available in every country. For a list of the TS150 relationship models (Machine Types 70LU and 70LW), contact a Lenovo or Lenovo Business Partner representative in your country. TS150 TopSeller models are country-specific; that is, each country may define their own server models, and not all server models are available in every country. The TS150 supports one processor. The following table lists the specifications of the processors that are available for the TS150. Lenovo DDR4 memory is compatibility tested and tuned for optimal ThinkServer performance and throughput. From a service and support standpoint, Lenovo memory automatically assumes the system warranty, and Lenovo provides service and support worldwide. The TS150 server has four DIMM slots, and it supports DDR4 UDIMMs with ECC memory protection or without ECC protection. The processor has two memory channels and supports two DIMMs per channel. The TS150 server supports memory configurations with 1, 2, 3, or 4 UDIMMs. The TS150 server supports up to 2133 MHz memory speeds for one DIMM per channel and two DIMMs per channel configurations, provided that the processors support this memory speed (see the Processor options table in the Processors section for details). The TS150 server supports 2133 MHz and 2400 MHz UDIMMs. Mixing 2133 MHz UDIMMs and 2400 MHz UDIMMs is supported; however, all UDIMMs in the server will run at the same lower speed up to 2133 MHz. The TS150 server supports UDIMMs with ECC memory protection (Worldwide) or without ECC protection (China only). Mixing ECC and non-ECC UDIMMs is not supported. The following table summarizes memory speeds and capacities that are supported by the TS150 server. The following table lists the memory options that are available for the TS150 server. These configurations are shown in the following figure. In addition, the TS150 server can be upgraded with 2x SD card internal slots. The SD card slots are connected to the Intel Platform Controller Hub (PCH) via USB. The following table lists the internal storage expansion options that are available for the TS150 server. The ThinkServer TS150 3.5" HDD to 5.25" Tray Convertor Kit is required when a 3.5-inch drive is installed in the ODD/backup drive bay. The ThinkServer TS150 3.5" HDD to 5.25" Tray Convertor with Slim ODD Kit is required when a 3.5-inch drive is installed in the half-high ODD bay, or a slim optical drive is installed in the half-high ODD bay, or both. The TS150 FDD to 2.5'' HDD Convertor Kit is required when a 2.5-inch drive is installed in the 2.5-inch drive bay. The SDHC Flash Assembly Module adds support for the use of up to two SD cards in the server. The following table lists the internal RAID controllers and the additional options that are used for the internal disk storage of the TS150 server. # RAID 121i is an onboard hardware-assist RAID controller. The RAID 121i is an onboard RAID controller that does not consume a PCIe slot. The RAID 520i adapter is supported only in the PCIe slot 3. Important: The RAID 121i controller is not supported by virtualization hypervisors, including VMware vSphere (ESXi), Linux KVM, Xen, and Microsoft Hyper-V. The following table summarizes features of supported internal storage controllers. * The RAID 121i is a hardware-assist, software RAID feature (Intel Rapid Storage Technology Enterprise [RSTe]) integrated into the Intel C236 Platform Controller Hub (PCH). ** Up to four ports are used for SATA HDDs or SSDs, and the remaining two ports are used for optical drives; or up to five ports are used for SATA HDDs or SSDs, and the remaining port is used for an optical drive. The following table lists drive types and internal drive bay configurations that are supported by the internal RAID controller. 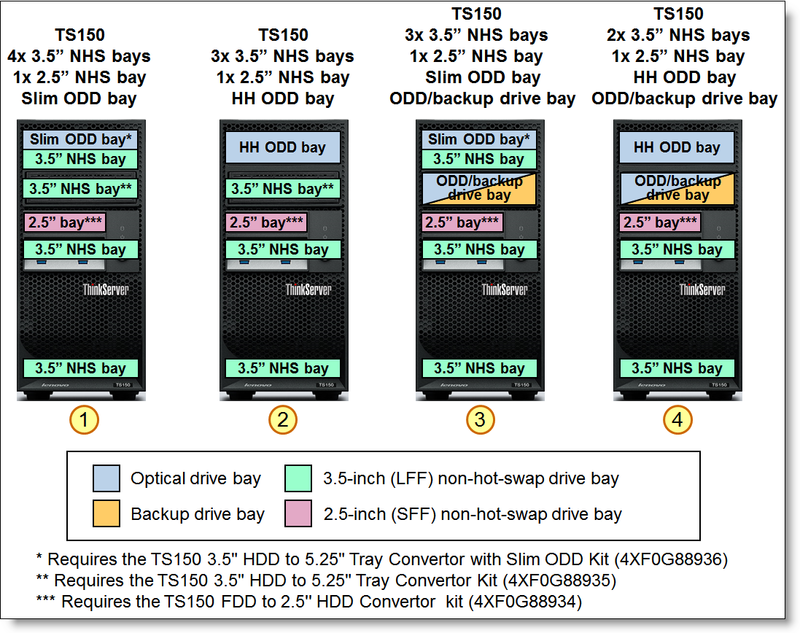 The TS150 server supports the internal drive options listed in the following table. The TS150 server supports the optical drive options listed in the following table. The SATA Optical Disk Drives support the following types of media: CD-R, CD-ROM, CD-RW, DVD-R, DVD-R (dual-layer recording), DVD-RW, DVD+R, DVD+R (dual-layer recording), and DVD+RW. A slim optical drive allows support for up to 4x 3.5-inch + 1x 2.5-inch internal drive bays in the server without a second optical drive or an internal backup unit; or up to 3x 3.5-inch + 1x 2.5-inch internal drive bays in the server with a second optical drive or an internal backup unit. The 3.5" HDD to 5.25" Tray Convertor with Slim ODD Kit (4XF0G88936) is required to support a slim optical drive. A half high optical drive limits the maximum number of internal drive bays to 3x 3.5-inch + 1x 2.5-inch in the server without a second optical drive or an internal backup unit; or to 2x 3.5-inch + 1x 2.5-inch in the server with a second optical drive or an internal backup unit. If two optical drives are used, an internal backup unit is not supported. The TS150 server supports the internal backup unit options listed in the following table. Configuration note: If an internal backup unit is used, a maximum of one optical drive is supported. The TS150 server has one integrated Gigabit Ethernet port that is based on the Intel I219LM NIC (a shared port for operating system access and management network). The following table lists the network adapter options for the TS150 server. * Available only in China. The TS150 server supports the GPU adapter options that are listed in the following table. Note: A GPU adapter is required for server models that use processors without integrated graphics; a GPU adapter is not available for selection for server models that use processors with integrated graphics. The TS150 server supports one 250 W AC (100-240 V) fixed power supply (80 PLUS Bronze) or one 400 W AC (100-240 V) fixed power supply (80 PLUS Platinum). A country-specific power cord is included with the server (except EMEA models; EMEA models do not ship with a power cord). The ThinkServer TS150 models with Intel Xeon E3-1200 v5 processors support Intel Active Management Technology (AMT) which provides out-of-band, hardware-based advanced system control, monitoring, alerting, and remote presence functions. The TS150 models with Intel Core i3, Pentium, or Celeron processors support Intel Standard Manageability (ISM), which is a subset of the AMT features. In addition, AMT supports KVM (keyboard, video, mouse) redirection (KVM redirection requires an Intel Xeon E3-1200 v5 processor with integrated graphics). Important: Health monitoring, event log, alerts, hardware inventory, boot device selection, and remote power control features are accessible out-of-band with a web browser. Serial over LAN, IDE/USB Redirect, and KVM redirection features require third-party tools that are not supplied or supported by Lenovo. Both AMT and ISM operate independently of the server and remain operational even if the server is powered off. Out-of-band management is performed through the Ethernet port 0, which is a shared port for data and management. The ThinkServer EasyUpdate firmware update tool enables you to maintain your server firmware up-to-date and helps you avoid unnecessary server outages. The following table lists the TCM option. The ThinkServer TS150 can be mounted in a rack cabinet by using the tower to rack conversion kit that is listed in the following table. The tower to rack conversion kit includes a shelf on which the server is placed, sliding rails for mounting a shelf, and a cable management arm (CMA). The ThinkServer TS150 has a three-year or one-year warranty (model dependent) with 24x7 standard call center support and 9x5 next business day onsite coverage. Lenovo offers warranty maintenance upgrades and post-warranty maintenance agreements with a well-defined scope of services, including service hours, response time, and length of service coverage. The following table explains warranty service definitions. On-site service A service technician will go to the client's location for equipment service. 24x7x8 hour A service technician is scheduled to arrive at the client’s location within eight hours after remote problem determination is completed. Lenovo provides service around the clock, every day, including Lenovo holidays. 9x5 next business day A service technician is scheduled to arrive at the client’s location on the business day after remote problem determination is completed. Lenovo provides service 8:00 am - 5:00 pm in the client's local time zone, Monday - Friday, excluding Lenovo holidays. Calls received after 4:00 pm local time require an extra business day for service dispatch. Lenovo’s Priority Support Offering enhances our award-winning call center support to provide top priority queue assignment to specialized Lenovo technicians. Priority support accelerates call center troubleshooting to get your problems resolved quickly, and includes other value-added support for Lenovo provided software tools. Priority support can be purchased stand alone to match the base warranty of your system or in convenient bundles with our same-day response services. Lenovo’s Keep Your Drive Multi-Drive service is a multi-drive hard drive retention offering that ensures your data is always under your control, regardless of the number of hard drives that are installed in your Lenovo server. In the unlikely event of a hard drive failure, you retain possession of your hard drive while Lenovo replaces the failed drive part. Your data stays safely on your premises, in your hands. Keep Your Drive Multi-Drive covers multiple drives and multiple failures with one service offering at one value price. This service can be purchased stand-alone to match the base warranty of your system or in convenient bundles with our same-day response services. The TS150 server can be attached to external NAS storage via 1 Gb Ethernet network, or SAN storage systems via 1 Gb iSCSI with an iSCSI software initiator in the operating system. The following table lists the external storage systems that are offered by Lenovo and support 1 Gb Ethernet NAS or 1 Gb iSCSI connectivity. * Available worldwide (except China and Japan). ^ Available only in China. ** Available only in Japan. # x represents a geo-specific letter (for example: U = North America, G = EMEA). Ask a Lenovo representative for specifics. The following table lists the top-of-rack Ethernet switches that are offered by Lenovo that can be used in ThinkServer TS150 solutions. The following table lists the rack cabinets that are offered by Lenovo that can be used in ThinkServer TS150 solutions. The following table lists the KVM switches and consoles that are offered by Lenovo that can be used in ThinkServer TS150 solutions. The following table lists the power distribution units (PDUs) that are offered by Lenovo that can be used in ThinkServer TS150 solutions. The following table lists the uninterruptible power supply (UPS) units that are offered by Lenovo that can be used in ThinkServer TS150 solutions.